When it comes to artistic talent, South Jersey has no shortage. That was more than clear from the response to our Top Artists contest, which attracted dozens of worthy entrants crafting intriguing pieces across a broad range of media. Here, meet five outstanding winners and find out what drives them to express their creativity. Erin McGee Ferrell (pictured) lives in Moorestown, grew up in Kentucky, and studied art at Mount Holyoke College in Massachusetts, as well as in Seattle, Vermont, Italy and West Africa. When it comes to her artwork, she finds herself drawn to bustling settings, like the Italian Market in Philadelphia. “I believe that the energy of the atmosphere affects my painting,” she says. Her work is on display at Tortilla Press in Collingswood, and one of her largest works to date, a 7-by-24-foot mural, will be installed this month at the new AtlantiCare hospital in Hammonton. Gwynn Walker DiPilla began drawing at age 3, and hasn’t stopped since. 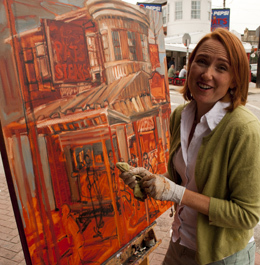 The Haddonfield woman not only creates art, but also teaches children and adults. Having studied at the Tyler School of Art, Studio Incamminati and West Chester University, Walker Di Pilla is focused on color, line and detail. “I’m taking everything I’ve learned and been teaching over the years and putting it into my art,” she says of her large watercolors. Her work is displayed at NK Thaine in Haddonfield and Arts Plus in Collingswood. Children, animals, pro athletes and judges—they’ve all been subject matter for Carol Vennell Sciolla, a Mooresown portraitist known for her precise, lifelike creations. The Art Institute of Philadelphia graduate started her career as a fashion illustrator for Strawbridge and Clothier, before moving on to become a freelance designer for newspapers, magazines and pattern companies. Later, Sciolla developed a passion for portraiture—which she exercises in both her personal art and in commissioned works, like pieces she’s done for the Trenton Courthouse. Haddonfield resident Robert Lipartito studied art in Philadelphia at the Fleisher Art Memorial and the Pennsylvania Academy of the Fine Arts—and the influence of this extensive formal training is evident in his drawings, oil paintings, etchings and lithographs. Lipartito focuses on commonplace subjects like portraits and still lifes, but treats them in a way that’s “impressionistic but also, conversely, expressionistic, too,” he says. “The more abstract you make it the more real it looks.” Lipartito’s work has shown at galleries including The Goggle Works Center for the Arts in Reading, Pa., the Perkins Center for the Arts in Moorestown, the Center for the Arts in Southern New Jersey and Philadelphia’s City Hall. Diane Wallace never attended an art school—but her passion for life, nature and animals has drawn her to watercolor, using a wet-into-wet technique and a limited palette to create spontaneous and vibrant images. Wallace, who teaches drawing at the Medford Senior Center, spent just half an hour on this glowing still life of sunflowers. Burlington County owns a few of her prize-winning pieces, which can be found at the Medford Department of Recreation.